Teresa Combs, 62, of Hopkinsville died at 7:30 p.m. Monday, January 28, 2019 at Vanderbilt University Medical Center. Funeral services will be 12:00 p.m. Friday, February 1, 2019 at Hughart, Beard & Giles Funeral Home. Burial will follow in Riverside Cemetery. Visitation will be Thursday from 4:00 – 7:00 p.m. at the funeral home. Hughart, Beard & Giles Funeral Home is in charge of the arrangements. A native of Hopkinsville, KY she was born October 15, 1956 the daughter of the late William Joseph Simpson and Clara Virginia Mason Simpson. 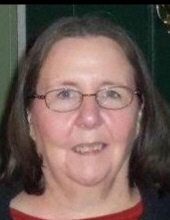 She was a retired Board Certified Teacher from Indian Hills Elementary School. She was a member of First Christian Church. She was preceded in death by her husband, Edward Tarling Combs, who died in 2010. Survivors include her son: Justin Combs of Hopkinsville, KY and her brother: William Patrick Simpson of Kuttawa, KY.
Memorial contributions are suggested to First Christian Church. To plant a tree in memory of Teresa Combs, please visit our Tribute Store. "Email Address" would like to share the life celebration of Teresa Combs. Click on the "link" to go to share a favorite memory or leave a condolence message for the family.